Everyone enjoys carving pumpkins around Halloween, but it can be messy and challenging. Here are tips on how to get your perfect pumpkin. The type of pumpkin you choose to carve can determine your carving’s fate. Look for a large pumpkin — the larger, the better. Pumpkins with a light color also tend to be softer and easier to carve. And look for bruising or moldy stems before you purchase your pumpkin because that will cause early spoiling. As you cut off the top of your pumpkin, try to angle the cut so your top won’t fall into the pumpkin when the cut is complete. Next, remove the seeds and “guts” of the pumpkin, scraping the sides until they are clear — this will help to prevent early rotting. Another trick is soaking your newly clean pumpkin in bleach water (1 teaspoon bleach to 1 gallon of water) for a couple of hours. 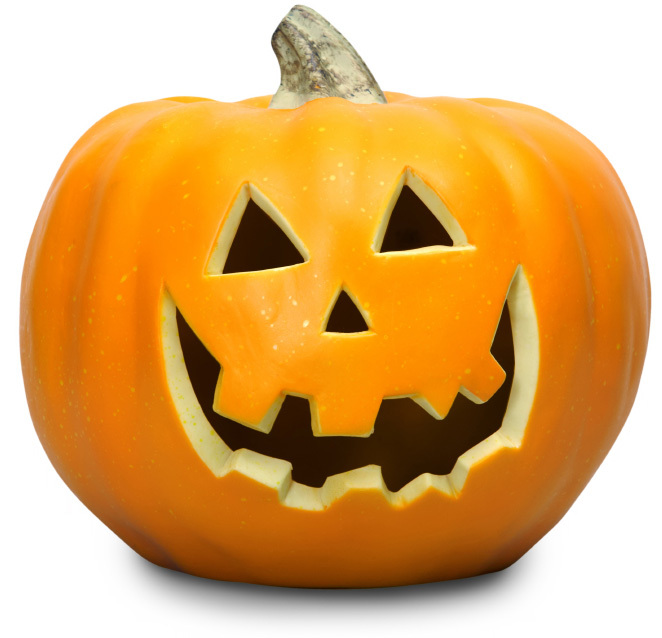 Once the pumpkin is dry, rub the inside and outside with vegetable oil or petroleum jelly to prevent shriveling. Don’t forget to save the seeds for a tasty treat later on! Now that your pumpkin is clean, it’s time to pick a template. Your pumpkin’s face can be anything you want — scary, funny, entertaining, etc. Most store-bought pumpkin carving kits include a book with multiple faces to choose from, but you can also get inspiration from the web. Your pumpkin doesn’t have to have to be a classic scary face — it could even be someone’s actual face. If you are a beginner, though, make sure to stick to simple designs. Cut out the areas of the template that you wish to carve into the pumpkin and using a Sharpie or a small thumb tack, trace around the edges of the template. You can tape the template on the pumpkin for this step or hold it in place. Using a serrated knife, begin to cut around the edges of your outlined template. These knives are usually included in a store-bought kit, but a regular serrated knife you have on hand will do. Move the knife along the edges of your template in a sawing motion. Take your time with this step — make sure you don’t leave any marker showing. This is the most time-consuming step, so be patient. Once your carving is complete, it’s time to light your pumpkin. Carving the bottom off of your pumpkin can help with this step — not only will it provide easier access to the candle, but it will make it easier to carve and more stable. Simply place the candle on a wide enough fire-proof base and slip the pumpkin right over it — just make sure you cut off enough space on the bottom to accommodate the candle. If you do not choose to cut the bottom off, consider using a flameless candle or votive candle in a glass holder. These options make it easier to regulate the temperature inside the pumpkin to prevent a fire hazard. It is also recommended that you leave the lid off of your jack-o-lantern, but if you must put the lid on, make sure to carve a hole in the unseen back side of the pumpkin to serve as a chimney. To make your pumpkin stand out you can add decorating accessories. Any of these awesome kits will help add pizzazz to a garden-variety pumpkin. If carving pumpkins is too messy and takes too long for you, these stick-on decorative items can also take the place of traditional carvings. Paint is another great alternative to carving as well. Halloween on a dime: Frighteningly frugal fun!